Mood Board: Informed by the half-wild sculptures of artist David Nash, Oliver Spencer's A/W 2015 collection explored the rough and the smooth. Sharp silhouettes were executed in soft textures; the charcoal lambswool combined with cream shearling was an ode to Nash's charred wooden works. Best in show: As one of British contemporary menswear's undisputed masters of casual attire, Oliver Spencer showcased a series of refreshing updates on classic shapes. 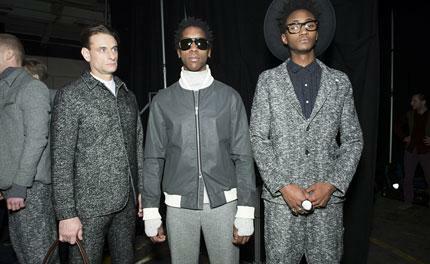 Standout pieces were luxurious suede bomber jackets, quilted khaki trousers and bright blue workman-style bottoms. Team work: The show's relaxed vibe was quite literally amplified by a lively soundtrack courtesy of The Turbans. This vibrant musical collective's fusion of Eastern and European music, together with a model line-up that felt like a cross-section of stylish men of all shapes and sizes, carried out a message of unity and togetherness.